Faced with an unexplained malfuntion on a brand-new compressor, Sundyne enlisted the help of dynamic simulation for its investigation. This allowed the firm to identify the problem, demonstrate that is was not at fault, and find an effective solution. Alain Cuenot told us the story. Can you describe this compressor to us ? It’s a huge, 190m³ machine weighing 50 tonnes that we designed and manufactured to perform an off-gas function: it takes in gas that would otherwise have been wasted for the operator, compresses it to 23 bars, and reuses it. We discovered a serious problem right from initial on-site testing: each time it shut down, the compressor surged; in other words, there was a violent hammer effect throughout the shutdown phase, with a significant risk of failure. "Surge-free" shutdown phases must have been planned for, surely? Of course. Most centrifugal compressors are fitted with recirculation loops, allowing them to recirculate gas flows in such a way as to prevent any surge effect. We were facing a serious, unexplained problem. We enlisted the help of our experts and dispatched an on-site technician. Sometimes a single detail can lead to the surge protection system not working properly. However, in this case, everything was as it should be. To continue our investigations, we turned to RSI (now CORYS), which carried out the initial dynamic simulation study for the compressor. What was the benefit of this new series of simulations? We wanted to push the digital model to its limits and assess the sensitivity of each parameter; something that could clearly not be done in real life. In addition, our technician reported the normal on-site operating conditions of the compressor, including actual values for temperature, pressure, flow and so on. We started out by matching RSI’s digital model to the actual on-site data. 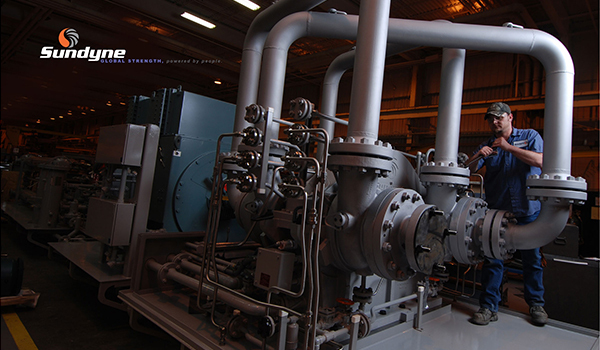 Based on the resulting status, we simulated shutdowns of the compressor drive motor for various speeds, various high gas pressure levels, abnormally low or high entities of gas, imbalances between the two compression stages, and so on. Did you finally manage to find out what was wrong? Yes indeed! The input temperature of the gas to the compressor was 50° C instead of 80° C, as initially specified on its data sheet. It contained much more condensate than initially planned for. This condensate was building up in the recirculation loop at the surge protection valve, with the result that the latter was less effective. A new simulation in which the valve was partially opened replicated the malfunction in question. Another, simulating a higher flow coefficient for the surge protection valve, showed the compressor shutting down without any hammer effect. The conclusion was that the cross-section of the surge protection valve needed to be increased so that the liquid condensate did not prevent the process gas from passing through, thus allowing the compressor to stop without surging. How did your client respond to these explanations? This is where dynamic simulation really came into its own: the client not only validated our study, but also acknowledged that we were not at fault. All we had to do was find a solution with minimal on-site impact, without having to cut any pipework or redo any electrical or mechanical connections. Once again, simulation provided us with the answers: there was no need to install an additional valve or carry out a full replacement of the surge protection valve, which would have entailed alterations to the pipework; changing the internal components sufficed. What takeaways did you have from this case? An issue which could have become a serious matter of dispute for Sundyne became a great success story. We demonstrated our agility, expertise, and ability to find a quick, inexpensive solution. In addition, we’ve decided to purchase an Indiss Plus® licence so that we can benefit from the software together with support from CORYS for jobs involving critical procedures.